Wrist Cuff Size 5.25" - 8.5"
The Omron 3 Series Wrist Monitor is portable, convenient and simple. This lightweight model gives users the benefit of being able to check their blood pressure on the go. Plus, the exclusive Advanced Averaging Technology displays the average of the last 3 readings taken within 10 minutes. This wrist monitor is very easy to use and easy to read. Elderly man with Parkinson's Disease has tremors on left side only, but could not see any way to set up for right arm. When medications are working it is a great instrument for blood pressure readings. What size wrists will this monitor fit? 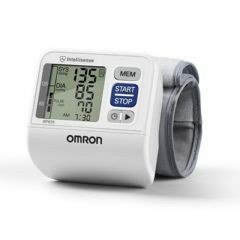 Hello Roy, the Omron Automatic wrist blood pressure monitor - 3 series will fit Wrist Cuff Sizes 5.25" - 8.5"